When Mark Madison is arrested for his third DUI, big brother Blaine pulls a few strings, sending Mark to convert a rundown hacienda into an orphanage. It’s the prodigal’s last chance to straighten out his life - and to prove that he’s worth his weight at Madison Engineering. But Mark can’t get rid of a stray piglet that adopts him, and his attempts to court the pretty Corinne Diaz fall flat. And he soon realises that no one could make a go of a project in a place where promises of manana could be tomorrow or next month - or where the village is plagued by some Aztec voodoo-hoodoo. Corinne watches Mark with a judgmental eye, certain that his past irresponsibility will destroy the project - that is, until she is reminded that God gives second chances to His children. When someone tries to drive Corinne and Mark from the hacienda, the couple must unite in heart and faith just to survive. About "Fiesta Moon (#02 in Moonstruck Series)"
When Mark Madison is arrested for his third DUI, his big brother arranges forhim to convert a rundown hacienda into an orphanage. It's the prodigal's lastchance to straighten out his life--and to prove that he's worth his weight atMadison Engineering. The sun rising above the Sierra Madres glared in Mark Madison's eyes, despite his costly designer sunglasses, as if to punish him for daring to emerge before it reached the high point of its day. It reminded him of the receptionist at Madison Engineering Corporation, who welcomed him for a rare early morning appointment with cheer-veiled sarcasm. "Good morning, Mr. Madison," she said but meant, That's what you get for staying out on the town when the rest of us working stiffs have to get up early to make a living. Mark's lips pulled into a righteous grimace as he gripped the wheel of his rental car. He did a lot more than those nine-to-fivers thought-especially Blaine-and they'd realize it now that he was temporarily on leave. "Three strikes and you're out," Blaine said after Mark's most recent DUI hearing. "You've got to pull your life together, Mark. I'm tired of bailing you out of trouble and making excuses for you to Mother." Mouth thinned with disapproval, he handed over Mark's license. "If you are pulled over for anything unrelated to the project, kiss this good-bye, because you won't need it where you'll wind up. As it is, your performance in Mexico will determine whether you have a job when you return." Blaine's condescension had fanned the fires of Mark's shame into rebellion. "I never asked you to make excuses for me. I never asked for you to bail me out of this DUI either. I'm my own man, whether you believe it or not." At least Mark was as much a man as he could be, with a big brother who filled their ambitious father's shoes to the brim and a baby sister who had earned a doctorate in marine archeology before her twenty-sixth birthday. With ambition and brains taken, all that was left for Mark to claim was charm. Blaine ran his fingers through the silver salting his dark hair at the temples. "When are you going to get it through that thick head of yours that I'm trying to help you aspire to something beyond liver failure?" Mark bristled. "I'm a social drinker." "You're becoming more than that, Mark." Blaine drilled him with a challenging look. "Want to bet?" Mark knew he was being suckered in, but for some reason he bit. "Name the stakes." "If you keep the hacienda project on target and stay sober while you're doing it, I'll step down from our on-site management and let you take it over. There's nothing I'd rather do than stay in-house and let you do the traveling." Mark practically salivated. He never minded the work, but hated being confined to the office, filling in the pieces of projects that Blaine had already designed. He envied his brother's travel. What a waste for someone like Blaine to see the world, when he was just as happy to stay in the box with his wife and kids. Only a fool wouldn't jump at this. "You got yourself a deal, bro." "I can't watch you, Mark, but God will know if you value honor more than a good time." Blaine had been on a God kick since he'd met Caroline. And while it made Mark a little uncomfortable sometimes, he had to admit his older brother seemed a lot happier now. And when Blaine was happy, Mark's life was easier. So Mark got a Get-Out-of-Jail-Free card. Blaine and his church had used their pull to get Mark's jail time shifted to community service at some remote mission in Mexico-practically elevating Blaine to godly status in their mother's eyes. Blaine had saved Mark from ruin once again. As though living in a nice neighborhood and having a wife and 2.5 kids was all there was to aspire to in life, Mark thought, gearing down the sweet sports car as the incline became more steep. Not that he didn't like Blaine's wife and kids. What was not to like? Caroline loved everybody. Mark belonged to a mutual admiration society with his teen nieces, Karen and Annie. And he supposed the newest member of the Madison family, little Berto, made the perfect point-five of the national family average. Family was nice, but that wasn't "living" in Mark's estimation. That was squeezing into a box of conformity and pulling down the lid, when there was a world to see and experiences to try before a man got too old to enjoy them. Then, maybe, he'd settle for life in the box. As a busload of tourists passed him, two young ladies, their long blond hair tossed by the breeze, waved at him. Mark beeped the horn of the Jaguar XK8 convertible that he'd leased in Acapulco and flashed them a dazzling smile. He gunned the engine and soared around the bus, affording the girls, who'd hastily switched sides, a rakish wink. Blaine would have a hissy fit if he knew that Mark had switched his ticket destination from Mexico City to Acapulco, much less that he'd leased a car more suitable to his lifestyle in lieu of taking the bus. "Well worth the trip," Mark said in a wistful tone, wishing he was still there, sipping a frozen drink-regrettably without the alcohol he'd promised to abstain from-and watching the leggy beach beauties strut their stuff against the sun-splashed blue of Acapulco Bay. Instead he was headed over the season-parched Sierra Madres to do penance in a one-donkey village. Licking his dry lips, Mark reached for the bottled water in the walnut-and-leather-trimmed console as the truck ahead finally breached the crest and leveled off. To his increasing annoyance, it slowed even more, brake lights glowing. Mark impatiently took a swig of water and nosed around the vehicle. Seeing his way clear, he shot forward, when something in the periphery of his vision caught his eye-something moving out from under the truck. By the time Mark realized it was one of the lumbering vehicle's back tires, it was too late. The tire shot into the backside of the Jaguar, sending it fishtailing perilously close to the edge of the road, and dropped down into the ravine. Like a teetering giant, the braking truck skidded on its remaining tires across the road toward the ledge, the bare axle gnashing at the pavement in a trail of sparks. Mark gunned the engine of the Jag, streaking out of the truck's path and swerving back into the right lane. The truck ground to a stop at the cliff's edge, but Mark's overcompensation gave way to a teeth-jarring ride, reducing the Jag's high-performance features to those of the donkey cart sitting by a roadside stand, now dead ahead of him. Braking all the way on loose gravel and dirt, Mark not only upended the vegetable-laden cart, but took out the stand's canopy as well. Staring in disbelief, Mark watched the dust settle over the hood of the now stalled Jag. Draped over it was a collapsed corner of a blue construction tarp. The other three corners, still supported by poles, provided shelter from the sun for a rustic roadside fruit stand. From the shouts of "Ay de m�," barking, and braying emanating from the underside, it was inhabited by Mexicans, dogs, and a disgruntled donkey. Just as he registered that things couldn't get worse, the air bag released. Can things get any worse? Corinne Diaz wondered as she worked her way through the crowd of the village z�calo . Not that Mexicalli was that large. Its few cobbled streets snaked their way through a cluster of homes and businesses growing from the lake on which the town had been built. Crisscrossing the streets at whatever angles the landscape would allow, occasional dirt and stone alleys led to orchards or gardens that fringed the settlement landward. But all of Mexicalli seemed to have turned out for the Cinco de Mayo fiesta, along with their relatives from across the lake or up the mountain. And Corinne was searching the square for a pint-sized French soldier who was only seven-a very proud seven. "Ay de m�, Se�orita Corina, that boy 'Tonio makes no good." Corinne stopped, waiting for her portly housekeeper to catch up. If the steep winding streets of the town were a challenge to Corinne's lungs, poor Soledad was puffing like a tuba player. "Soledad, why don't you sit here in the square and keep an eye out for Antonio?" "Here," she said, handing the phone to the older woman. "Call the school if you find Antonio, and tell him to wait here until the rest of the cast finds him." The orphans from Hogar de los Ni�os were scheduled to put on a play reenacting the 1862 Battle of Puebla, where a few Mexican militia under the leadership of General Ignacio Zaragoza Seguin turned back French troops sent by Napoleon to occupy the country. "No, no, no." Soledad shoved the phone back at her. "I will catch the culprit by his ear and drag him back to the escuela. I don't comprehend this equipment much." Touch-tone hadn't quite taken over some of the more remote villages. Buttons were for clothes, not equipment, which was Soledad's word for anything she didn't understand. She only knew her heavy, black tel�fono. "It's like the computer," Corinne explained. "You just push ocho and the call button. Then it's just like your tel�fono, no?" Soledad arched half of the continuous black hedge of brow that separated her dark gaze from a low, copper-bronze forehead. She marveled at Corinne's wireless laptop, mostly for the photo albums stored in it, but marveling was as close to equipment as the Indio woman cared to get. "My tel�fono serves me well enough," she replied. As frustrating as this general attitude was, it was also part of the village's charm. With a sigh, Corinne reattached the cell phone to her sash. "Bueno," she conceded. "But if you see Antonio, just keep him here." She didn't want Soledad to have to climb the hill to the orphanage at the outskirts of the village. It was supposed to be her day off, but nothing went down in Mexicalli without Soledad's knowledge. Despite the lack of a phone in every home, news blanketed the town rather than spread through it. Who needed telephone lines when a network of neighboring clotheslines was far more efficient? "Feed him a churrito from the butcher's stand. I'll gather the rest of the troops at the school as soon as they've finished their dinner, and bring them over for the show." "Do not fret so. 'Tonio will show himself when the fun begins." Soledad reached up to tuck a loose strand of dark hair behind Corinne's ear that had escaped her upsweep. In addition to being cook and housekeeper at the orphanage, Soledad had also assumed the role of Corinne's due�a. A proper young lady did not live unchaperoned. "I wonder that you have one hair left on your head. You are the nurse; you are the teacher; you are the nanny." "Administrators wear many hats." Corinne wore those hats and many more as assistant to the priest who ran the orphanage. This morning, it had been that of janitor. Would the little ones ever learn to put the paper in the designated receptacle, rather than in the toilet, which was not designed to accomodate paper products? "Besides, I love what I'm doing." And she loved Mexicalli. Corinne scanned the shaded plaza once more for the errant commander de jour. The butcher, the baker, even the candlestick maker had set up makeshift booths on the plaza for the event. Along the adjacent side of the square were a number of Indios selling handmade crafts from petates, or woven mats of split palm. The Cantina Roja, Mexicalli's only eat-in restaurant, bar, and gathering place, had moved its tables across the cobbled street so that guests might partake of its food and drink and have a front-row seat for the festivities. Even now, a visiting group of mariachis from the village on the other side of the lake were tuning their instruments near the stage. "If I were your mama, I would say you should be making your own babies, not chasing after someone else's. It isn't like you need the money, no?" Corinne turned, a wistful smile settling on her lips. "No, Soledad. I've been very blessed. Although if the ladies at the orphanage where I was left as a ni�a had not chased after me and found me a good home, it might have been very different. I might be begging on the streets of Mexico City or worse. Now, maybe I can make a difference in another orphan's life." It was a God thing, of that Corinne was certain. The search for her biological mother had begun at Cuernavaca, where Corinne had been adopted at the age of two. From there, Corinne and her parents traced Mar�a Sanchez to Mexicalli, which at the time had no orphanage. There the trail ended. As for Corinne's birth father, he'd been recorded as an American artist, John Smith-probably not his real name. Since Corinne had blue eyes and a lighter complexion than the cocoa or copper tones of Mar�a's people, the chances were good that he'd been fair. lar name, and "John Smith" could have been any of the numerous Bohemian artists who came and went through the region. So instead of finding the parents who'd given her up twenty-seven years ago, Corinne had found what her life might have been like had she not been adopted and raised by loving parents. And Mexicalli itself was a charming village, seemingly frozen in time. It felt like home, a part of her she hadn't known existed. The place and the people, especially the orphans, so enchanted her that she felt led to give back some of the blessings she'd received. "Aha," Soledad exclaimed, drawing Corinne from her reflection. The housekeeper pointed across the z�calo to where a crepe-paper-bedecked runaway bowed in front of Mexicalli's wealthy patroness, Do�a Violeta. The setting sunlight crept under the jacaranda trees and glanced off the foil epaulets on Antonio's shoulders as he wielded his wooden sword against an invisible opponent. "Better we hurry before he annoys Do�a Violeta, and she ceases to help Hogar de los Ni�os forever. That one can be eccentric." Eccentric was an understatement for an eighty-three-year-old woman who rode around town in an upholstered donkey cart. Her burro always wore a straw hat with a band to match its mistress's somber dress. The color of the day was navy blue. Corinne stayed the housekeeper with her hand. "I'll take care of Antonio. You enjoy the rest of your afternoon." "Pues," Soledad said, easing back down on the park bench without much protest. "Perhaps I should untire myself." Smiling at the woman's unique grasp of English, Corinne set out through the picnicking clusters of family and friends gathered around the stage under the shade of the jacaranda trees. Her full skirt swished about her calves as she passed by so many familiar faces. Mexicalli was a small town, so even if Corinne did not know all their names, she had seen or dealt with most of the villagers in the two months since her arrival. She reached the opposite side of the plaza, where Antonio was regaling Do�a Violeta with the importance of his role. It had now advanced in rank from general to none other than Archduke Maximillian himself. "I am second only to the great Napoleon, who could have conquered even the conquistadores," the boy boasted, assuming a proud stance, hand on the hilt of his wooden sword. At that moment a thunderous clap erupted from the edge of the plaza where the road entered the city at its southern tip. The high-strung Antonio fumbled his sword. Do�a Violeta clutched her purse to her chest as though it had been her heart that made the noise. With the entire population of the z�calo watching, Capit�n Nolla-Mexicalli's only policeman-and mayor Rafael Quintana swaggered over to the truck as its passengers streamed out of the cab like clowns from a Volkswagen Beetle. But Corinne's attention was sidetracked by a lone figure that hopped down from the company of grunting swine in the back of the vehicle. 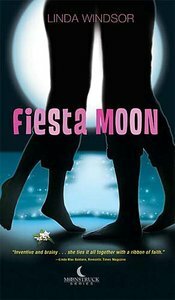 Customer Reviews For "Fiesta Moon (#02 in Moonstruck Series)"
Linda Windsor crafts a delightful romance between two imperfect and endearing characters who find themselves living at a dilapidated orphanage in a mountainside village in Mexico. Engineer, Mark Madison finds himself on the wrong side of the law from living a selfish and indulgent life in America. His older brother Blaine (from Paper Moon) saves him from jail time by sending him to the orphanage in Mexico to complete community service by overseeing  the renovation project. Social worker, Corinne Diaz having followed God's call on her life, is the administrator of the orphanage and hopes to find her biological parents while working in Mexicalli. Their first meeting is disrupted by a devoted pig, a Mexican burro and the clash of opposing wills hooking the reader into the tale. Linda portrays her characters with quirks aplenty yet with enough substance so the reader cares how the story unfolds. She uses minor characters to highlight the culture and history of Mexico and enhances the story with a thread of suspense surrounding an old superstition and the mysterious disappearance of one of the orphans. Hilarity and disaster go hand in hand with Mark as he learns to look beyond his own needs and as Corinne struggles with feelings for a man who denies God. Despite the predictability of the ending, this book is worth going along for the ride! Once in a Blue Moon, fame and fortune actually take a backseat to friendship and love. Jeanne Madison has earned her PhD at 26 and secured funding to find and excavate a treasure-laden 18th century caravel off the Yucatan coast. Between her mentor and a handful of graduate students, years of study, and all the government cooperation a marine archaeologist could want, she'll find the Luna Azul--or Blue Moon--by hook or by crook. When a tight budget forces her to hire Captain Gabriel Avery and his rust-bucket, Fallen Angel, the comely PhD's not sure it won't be the latter. The incorrigible skipper has the swarthy good looks of a Hollywood pirate and pushes every last one of Jeanne's buttons--even some she didn't know she had. His history of brawls, bullion, and well, romantic escapades may well sink the whole expedition. As the race for the Luna Azul treasure with an unscrupulous competitor gets heated, more than the fajitas start to sizzle. Soon Jeanne, the captain, and her crew must take a gigantic leap of faith, one that may salvage more than gold--perhaps even a hardened heart. Dear Reader, are you ready for more moonstruck madness? Mix a sassy senorita, an incorrigible Don Juan, and a haunted hacienda, and you get page-turning intrigue and romance. When American social worker Corinne Diaz arrives at a remote mountain village to volunteer at a local orphanage, she thinks it's a slice of Mexican heaven...until Mark Madison shows up. Saved once again from the clink by his brother, the engineer promises to stay sober and fly right. Battling the kindling chemistry between them, the stubborn opposites are determined to dispel an old superstition threatening the new orphanage. As the dilemma becomes more sinister, things get hotter than a basket of habaneros. Little do Corinne and Mark realize that while they work to save the project-and their lives-the Mexicalli moon is working on them. Sometimes an added pinch of faith can make just about anything possible! The owner and director of her own day care facility, Caroline Spencer approaches life with humour and child-like faith, but Blaine Madison, a hardened workaholic, seeks success and results. Yet in spite of herself, Caroline finds him irresistible.